This cute teddy bear diaper cake has all the essentials! Topped with a fun teddy bear and wrapped with colorful ribbon, this would be a delightful gift for an expecting mother. 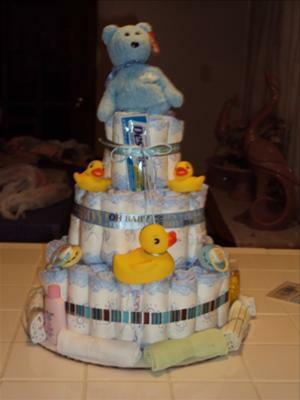 Vanessa from North Carolina has sent us this picture and a description of her diaper cake. Vanessa is adding her creativity to our amazing collection of real, useful, adorable and inspiring baby shower ideas. We love our readers! Vanessa, thank you so much for sharing your cute diaper cake! Share your own creative ideas and photos right here! It's the first cake I have ever made. Made with the most needed stuff and bule and brown ribbon, topped with a TY teddy bear "it's a boy".